Fifteen people have been killed by a teenage gunman who went on a rampage in south-west Germany, officials say. Among the dead were nine pupils, eight of them girls, and three teachers at the Albertville secondary school in the town of Winnenden, north of Stuttgart. The gunman, a 17-year-old former pupil named as Tim Kretschmer, entered the school at about 0930 (0830 GMT) in black combat gear and began shooting. He fled in a stolen car, but killed himself after being cornered by police. Officers say he shot himself dead after being wounded by the police. German Chancellor Angela Merkel described the shootings as "incomprehensible". "It is unimaginable that in just seconds, pupils and teachers were killed - it is an appalling crime," she told reporters. "This is a day of mourning for the whole of Germany." Officials earlier said a 10th pupil had died raising the death toll to 16, but this was later revised down to nine pupils. Baden-Wuerttemberg Interior Minister Heribert Rech said eight of the nine pupils who were killed were girls but he refused to speculate as to whether females in particular were targeted. Three teachers and three passers-by were the others who died. Police said the suspect was killed during a shoot-out with officers in the town of Wendlingen, about 40km (25 miles) away from the school. He had fled there in a car he had hijacked after the school shooting - killing a passer-by as he made his escape, police said. Spokeswoman Inka Buckmiller said the shoot-out took place at a car showroom, where two bystanders were killed and two police officers were injured. "The suspect also died as a result of this shooting," she said. Baden-Wuerttemburg state governor Guenther Oettinger said police killed the suspect, but officers later said he had killed himself. One woman said her daughter had been in the school at the time of the shooting, and she was now at home "trembling and crying". "She and her friend jumped out of the window. Her friend is now in hospital... We hope that she's all right," the woman said. "What can I say? I don't understand the world any more." Regional police chief Erwin Hetger said the teenager "went into the school with a weapon and carried out a bloodbath", according to the Associated Press. 2006: A former pupil injures 11 students at a school in western town of Emsdetten before turning the gun on himself. 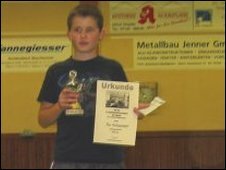 2002: A former pupil kills 17 people in his school in the eastern city of Erfurt, then kills himself. "I've never seen anything like this in my life," he said. Mr Hetger said informing the families of what had happened was a heart-breaking job. "Our thoughts are concentrated on the parents. I have looked some of them in the eye, and it's damn hard to keep your composure," he said. Local media reported that police had raided the suspect's house and recovered 16 weapons. The teenager's father, thought to be a prominent businessman in the area, was reported to be a member of a local shooting club. Eckehard Weiss, who coached Tim Kretschmer at table-tennis, told the BBC that he had been a relatively normal boy. Mr Weiss said he had wanted to be a professional table-tennis player and had even played a match last weekend.